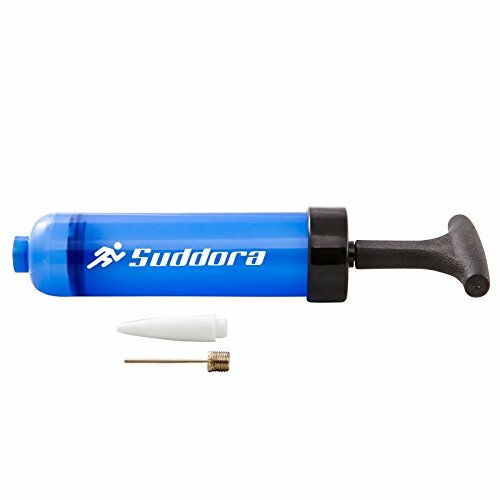 ✔COMPACT 8" PUMP - Our Suddora Hand Air Pump is only 8 inches and weighs only 2.4oz. Its small size makes it perfect for travel. Taking your ball to the beach or on vacation? Make sure you don't lose air while throwing the ball! Put our lightweight pump in your backpack or larger luggage. ✔TWO ATTACHMENTS INCLUDED - Comes with a metal needle and 1 plastic attachment. The metal needle fits all sports balls and is the most common. Use the plastic attachment for larger openings. ✔WORKS ON ALL SPORTS BALLS - Use for basketballs, footballs, volleyballs, soccer balls and more! Simply take small needle out of the top storage spot, screw it in and pump up any ball. ✔EASY NEEDLE STORAGE - Losing the needle for your pump is the worst! This is why our pump has a storage hole right on the top. After you are done inflating your sports ball simple put it back in so it is there next time you need it.